Peel grapefruit, including most of white membrane. Cut crosswise into four equal pieces. Scoop everything out, leaving only the pulp. Slice into half-moon pieces (about 1/8-inch). Then, cut half-moons widthwise into smaller pieces, about the size of your pinky finger in width. Peel the mango. Cut the mango into long, thick pieces (at least 1/2-inch). To get these thick pieces get as close as possible to the seed; cut the fruit lengthwise. From the thickest piece, take out thin and long strips that can be rolled up; lay strips on a paper towel to absorb moisture. The number of strips will determine the number of rolls you can make. Cut avocado into small pieces. Lay a strip of mango flat and place a small piece of grapefruit in center. Then place an avocado piece on top. 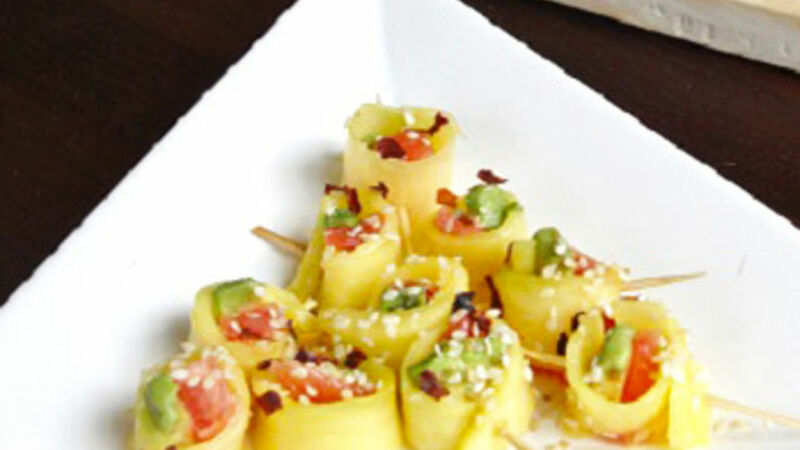 Roll up one of the ends of the strip of mango over the grapefruit and avocado like a wrap. Do the same for other end of mango. Insert a wooden skewer from one end to the other so piercing every piece of fruit, allowing to stay in place and work with it easily. Place the plate where you will serve it. Add a drop of grapefruit juice over the avocado to each roll in order to prevent oxidation. Lastly, sprinkle sesame seeds and pepper flakes to taste over the sushi rolls. Cut the avocado last, as it oxidizes quickly. For those who consider grapefruit a very bitter fruit, I will tell you that red grapefruit is an excellent alternative. When it’s perfectly ripe, it actually has the sweetness of an orange, with a pleasant citrus twist. This Sweet and Sour Sushi is a versatile dish that you can enjoy as a starter, side dish, dessert or simply as an anytime snack. With the natural explosion of colors found in fruits and the simplicity of its elaboration, this dish becomes a very eye-catching decoration on your table, its soft texture seemingly melting in your mouth. Enjoy!